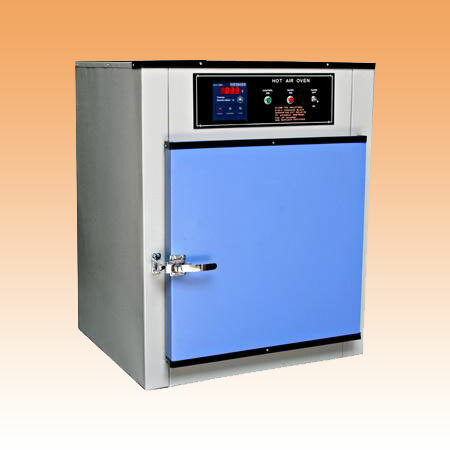 Electrically operated Ovens can be made as per desired sizes and ratings for laboratory or continuos heavy duty applications, made of either Stainless Steel, Aluminum or Mild Steel sheet (duly painted) with heavy duty hinges and latch. It can be also made with triple or double walled construction & either three sides heating or heating at bottom with naked heating elements or tube sheathed heating elements. Available with or without air circulating fan. It consists of different arrangement to keep the articles to be heated as per the requirement. Various type of temperature controlling arrangement such as: Thermostatic Controlled, Digital Temp. Controller / PID, ON – OFF type with contactor or thyristor, Heater Selector Switch etc.